Arnaldo Otegi on his release from jail on March 1. There were celebrations in the Basque Country and among solidarity activists around the world on March 1 as Basque political prisoner Arnaldo Otegi was released from a Spanish jail after more than six years. 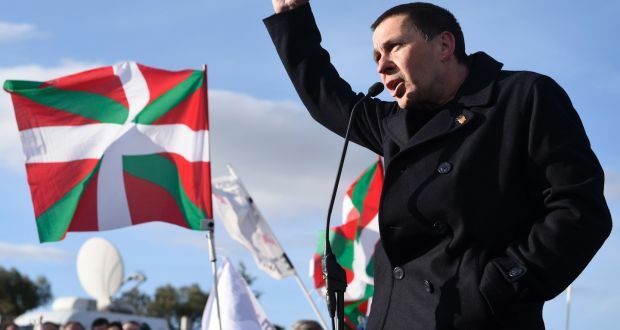 Otegi, a leader of the Basque struggle for self-determination, was jailed by the Spanish state for politically organising in support of Basque independence. Otegi has been a key advocate of the Basque liberation movement's shift towards relying on peaceful means of struggle. However, the Spanish state criminalises all expressions of support for Basque independence, equating even peaceful campaigning on the issue with terrorism. Already, Spanish authorities have sought to restrict rallies welcoming Otegi's release from prison. Spain holds hundreds of Basque political prisoners in its jail — using its controversial policy of “dispersion” to place them in jails far from the Basque Country and family and friends. An international campaign had called on Spain to release Otegi. A statement released last year calling for the activist's freedom was signed by well-known personalities around the world, including Nobel Peace Prize winners Desmond Tutu and Mairead Maguire and former Latin American presidents Jose Pepe Mujica, Fernando Lugo and Manuel Zelaya. In 2005, Otegi was sentenced for “insulting the King” after he commented at a press conference held on the torture of Basque journalists that the King bore ultimate responsibility for this torture as the official head of the armed forces. In March 2011, the European Court of Human Rights ruled that Spain had infringed Otegi's right to freedom of expression in this case. Other political charges brought against Otegi in recent years include being sentenced to jail in 2006 for taking part in a commemoration marking the murder of a leader of the armed Basque Homeland and Freedom (ETA) by a Spanish death squad in 1978. He was jailed again in 2010 for comparing a long-term ETA prisoner to Nelson Mandela. In October 2009, 10 central leaders of the Basque pro-independence movement, including Otegi, were arrested as they met to discuss a new peace initiative. Five of them were jailed. Despite such provocations, ETA declared a permanent ceasefire in 2011 and began disarming in 2014. A new pro-independence party committed to peaceful means, Sortu, was registered in 2013, reaching high levels of support across the Basque Country. Representatives of Irish republican party Sinn Fein, which campaigned for Otegi's freedom, welcomed his release. Sinn Fein member of European parliament Martina Anderson said: “I am delighted that today Arnaldo Otegi is being welcomed home by his family and community, and I send warm congratulations to him from Sinn Fein. “We also welcome the news that Arnaldo Otegi has confirmed he will take part in internal party elections later this month seeking to stand as a candidate for EH Bildu [a coalition of which Sortu is a member]. “But I'm appalled that he received this sentence in the first place. The fact that Otegi was jailed for more than six years solely for his ideas and political activism is an indictment of the Spanish authorities. Below is a translation of the speech Ortgi gave to supporters on his releae from jail. It is reposted from Basque peace Process. Some say that there are no political prisoners in the Spanish state, they say it with relish, some say it with animosity, but you just have to check all the cameras recording us to know that political prisoners do actually exist in the Spanish State. All these cameras are never there when social prisoners leave this prison, the cameras are never there when immigrants are expelled from these prisons, there are not this many cameras when humble and working people are evicted from their homes. So what we say is, for those of us who are Marxists, facts are those that are contrasted with reality, and the reality is that all these cameras wouldn't be here, if they didn't know that today, as on many other occasions, a political prisoner leaves a Spanish prison. Six, five years ago, they tried and jailed us for making a bet for peace. And I want to congratulate all of you, for having sustained that bet above all provocations, indeed peace is the way, but in that way our commitment has to be taken to the end and that's what I intend to do with all of you. When we were put in jail, we were imprisoned as Basques and as Basques we come out. As pro-independence we were imprisoned and pro-independence we come out. And as socialists we were imprisoned and as socialists we leave. So all I want to say to sum up, because I know that there is much curiosity about this issue is, the best Lehendakari (President of Basque Government), the best mayor, is the people!